Previously, my closest association with sweet tea was that time my kids added a bunch of sugar to berry tea when I wasn’t looking and wound up with a beverage that tastes like a liquid Jolly Rancher. But summer is approaching, and as a lifelong Northerner, I envy the South’s easy hospitality—always having a glass of sweet tea at the ready. Reese Witherspoon herself teaches us sweet tea is as vital a feature of the welcoming home as a pineapple symbol on the door-knocker. So as I set out to get my sweet tea methodology perfected before Memorial Day, I was soon bombarded with more preparation methods than there are states in the South. 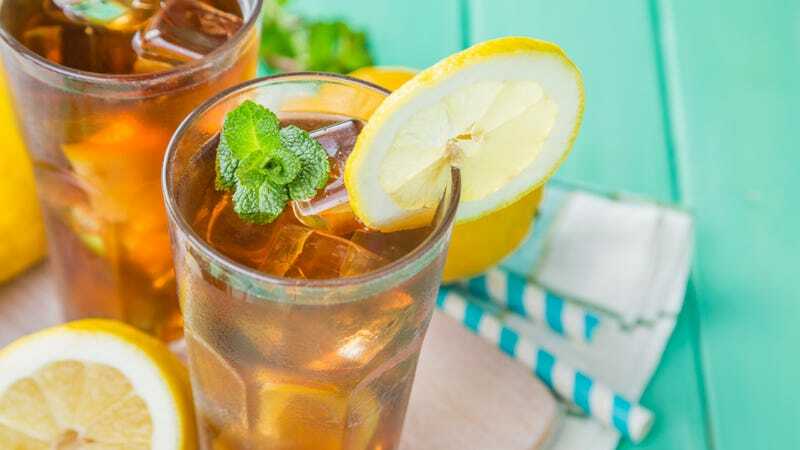 Just mixing sugar into brewed iced tea is a fool’s errand; we all know this, as the sugar does not combine well and often sinks to the bottom. Certain recipes involved so many pots and pitchers and simple syrups, your tea might as well come in a beaker. As Rick Bragg poetically wrote in his 1997 article “Savoring A Sweet Taste Of Southern Summers” for The New York Times, “In a region where the summertime air is thick and hot and still even when it’s the dark, where people work hard and sweat rivers, hot tea was senseless and unsweetened tea was just brown ice water.” That’s true: You never hear anyone talk about “sweet iced tea” down there. In that same article, Bragg mentions an involved method wherein he dissolves large tea bags in boiling water, then pours that mixture into some cold water that he has already added sugar to. Others mix sugar into a boiling tea mixture, then add cold water. That sounds like the easy method I was looking for. Sure enough, pouring the boiling water over the sugar and tea together dissolved it all instantly. After carefully letting my pitcher cool before putting it in the fridge (yes, I have made that unfortunate mistake before), I chilled the tea. You can stop there, of course, but I added lemon and lots of mint. It was delicious—and as Paul predicted, delightfully fragrant—so much so that the kids didn’t even miss the Jolly Rancher element. This tea was definitely a beverage I can see in a permanent spot on the top shelf of my fridge this summer, alongside a large bowl of lemons. So, sweet tea accomplished. Now, who’s got the perfect potato salad? Put four tea bags and sugar in a bowl. Pour boiling water over the tea and sugar and let brew briefly, until the liquid turns dark. Allow to cool, then pour into pitcher. Place in fridge to chill. Serve with ice cubes, and mint and lemon if you like.